China Evergrande Group, the country's largest property developer, stepped up a buying spree of shares in rival China Vanke Co Ltd in the weeks after a warning from the Shenzhen Stock Exchange that it is closely monitoring Evergrande's investments in listed companies. Evergrande boosted its stake in Vanke to 14.1 percent, bringing its total expenditure on Vanke's A-shares to about 36.3 billion yuan ($5.3 billion), according to a regulatory filing on Tuesday. The Guangzhou-based home builder bought a further 509.8 million A-shares on the market and through block trades from Nov 18 to 29, the company said. Vanke's A-shares rose 3.13 percent to close at 26.98 yuan per share in Shenzhen on Wednesday. The shares have surged more than 50 percent since early August, when Evergrande first disclosed a stake in the developer. Controlled by billionaire chairman Hui Ka Yan, Evergrande has been on a debt-funded buying spree in the past year. 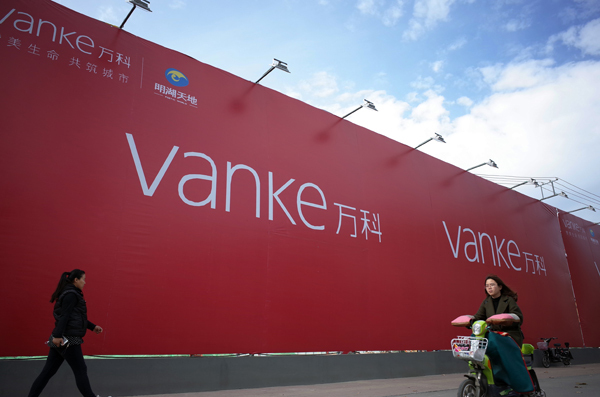 It boosted shares in Vanke just days after a Nov 11 statement from the Shenzhen bourse that it has strengthened supervision of trading accounts controlled by Evergrande after finding "abnormal trading behaviors" that affected share prices of Vanke and others. Evergrande has emerged as the wild card in a battle for control at Vanke, which has been at the center of an ownership battle after a little-known company called Baoneng Group amassed a large stake starting last year. Vanke has previously labeled Baoneng's advances as a "hostile takeover." Evergrande cited Vanke's "strong" financial performance as a reason for its investment when it started buying shares earlier this year.